Third Bay Quilt Shop, established in June of 2007, began as a dream and turned into reality in the converted third bay garage of my home, hence the shop's name. While it is a small shop, it is mighty in numbers with over 1,400 bolts of beautiful fabric personally selected by me to meet your quilting needs. You will find a delightful array of fabrics from Red Rooster, Maywood Studies, South Seas, Lynhurst Studios, Blank, Thimbleberries, Benertix, Northcott, Michael Miller, Lakehouse, Camolot, Elizabeth Studios, Marcus, Windham Fabrics, Avlyn, Henry Glass & Co., Timeless Treasures, Paintbrush Studios and Robert Kauffman. 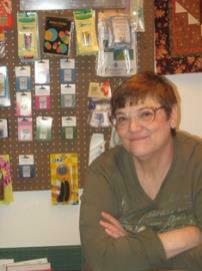 I also carry a large selection of Fat-Quarter bundles, kits, patterns, books, notions and great selection of thread. Quilting is my passion. When not working in my shop, I love spending time creating my own quilting projects. I look forward to you stopping by Third Bay Quilt Shop to see what all is available to you for your own quilting projects.